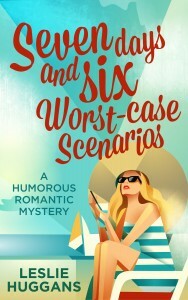 Full of fun, quirky characters and a solidly plotted mystery, with a taste of romance, Seven Days and Six Worst-Case Scenarios has something for nearly every reader. Taking a vacation with your best friend should be simple and pleasant enough, but Victoria manages to get herself in trouble nearly from the start. She attempts to stop someone from escaping police custody and puts herself in direct opposition to the head crime boss in the area who sets out to punish her. Add in an old flame, Alex, plus Mr. X and his monkey and you have an edge of your seat thriller with the added bonus of humor and sexiness. I’m such a sucker for stories with characters outside the norm, and this story doesn’t disappoint. Sometimes, though, so much attention is paid to them that the mystery portion of the plot gets a bit neglected. Not so, here. The romance isn’t quite as strong a part of the story, but it really isn’t meant to be the focus, so it never bothered me that it took a bit of a back seat to the rest. Victoria is both funny and sometimes irritating. For every few times she made me laugh, I’d have a moment where I wanted to smack her. She’s sassy and irreverent, but so much fun to read about. Yes, the plot was very good, but it was the characters that kept me reading and will have me coming back for more. The book was packed with so much, though, the wrap up felt just a tiny bit rushed. Nothing that ruined things or made me dislike the book. But really, it was the only downside to what was otherwise just a fun, intriguing, solidly written mystery with romantic elements. I really, utterly enjoyed it and can’t wait for more from the author, especially if we revisit these folks again!